These days, nearly everyone is talking about “cutting the cable cord” from expensive satellite and cable packages and migrating to subscription-based services. With smart TVs, streaming media devices like Apple TV and the Amazon Fire TV Stick, and blazing-fast internet options, you can ditch cable and still enjoy the golden age of TV on your own terms. However, depending on how many streaming services you subscribe to, the savings aren’t always bountiful. If you want the basics (like Netflix or Hulu), live sports (like MLB.TV or the NFL Network), and a prestige channel (like HBO NOW), your monthly cable-cutting tab could add up. That is, these streaming services can add up if you’re paying for them. If you’re “borrowing” one from your parents, sharing another with a roommate, and splitting the cost of a third with your partner, you might be stealing your way to a fairly good deal. So which streaming services are the most popular, and which are the most likely to be shared? We surveyed 1,000 streamers to learn how ethical they think it is to share their passwords with friends and family, who’s more guilty when it comes to communal logins, and how many feel pressured to dish out their personal details. Keep reading to see what we discovered. By the end of 2018, an estimated 33 million adults across the U.S. officially “cut the cord” and transitioned from cable and satellite providers to streaming services. That represents a near 33 percent increase over 2017. As a result of lower prices and increased control, streaming has become a popular solution for TV and movies. Among the available platforms, one service stands out: Netflix. While roughly 3 million subscribers still utilize Netflix for its DVD rental offerings, another 130 million people around the world use Netflix for its streaming service. However, while Netflix was the most popular service among streamers polled (almost 86 percent), it wasn’t the most shared. That distinction was saved for MLB.TV, where nearly 77 percent of people utilizing the service admitted to either giving or receiving their access through a shared password. For sports fans, quitting cable can be especially difficult, and the relatively high price of MLB.TV continues to rise. 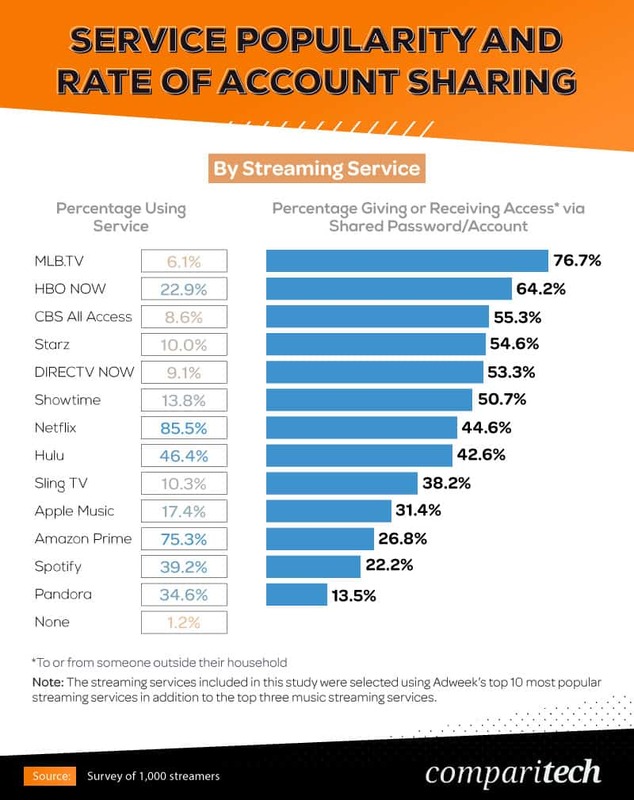 Regularly shared streaming platforms also included HBO NOW (64 percent), CBS All Access (55 percent), and Starz (55 percent). Music streaming services including Spotify (22 percent) and Pandora (13.5 percent) were the least likely to be shared between users. Sharing your Netflix password doesn’t just cost the company over $500 million in revenue each year – it’s technically illegal. Of course, the legality of passworhttps://www.thesimpledollar.com/is-it-ok-to-share-your-netflix-account-the-lowdown-on-log-in-sharing-at-nine-popular-services/d sharing also happens to be extremely technical, making it difficult to enforce and easy to ignore. Across all ages, a majority was aware of their streaming platforms’ sharing policies. As we found, many were comfortable violating them anyway. More than 3 in 4 Gen Zers and over 3 in 5 millennials agreed it was ethical to give non-paying consumers access to streamed content. Nearly as many felt similar about receiving access to streamed content. The consensus was less positive among older generations. Only 34 percent of Gen Xers and baby boomers considered giving away paid access to streaming services ethical, and fewer felt comfortable receiving that access. If sharing your paid streaming account violates a company’s policy, who’s more at fault when it happens: the giving or receiving party? The answer may not be entirely clear. While a majority of Gen Xers and baby boomers agreed both parties were equally guilty, even they weren’t in unison. At the very least, being on the receiving end might be the least ethically compromising position. At most, just 10 percent of baby boomers identified the receiver of account sharing as being solely guilty for violating the rules. If any one party was at fault, all four generations agreed the person giving out their login credentials was to blame. But just because the rules say you aren’t allowed to give out your password doesn’t mean doing it anyway makes you wrong, at least not according to some. Nearly 49 percent of Gen Zers and 33 percent of millennials suggested neither party was guilty when account information exchanged hands. 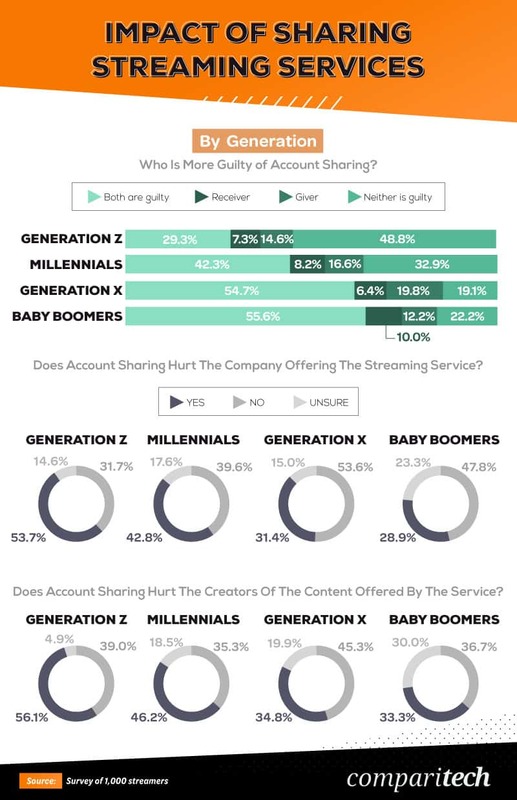 Younger generations were also the least likely to imply account sharing hurts the companies that offer streaming services, and even more believed account sharing doesn’t hurt the creators of that content. Yes, sharing your streaming password is a federal crime. But most analysts say if you’re doing it, there’s nothing really to worry about. Perhaps for this reason, the No. 1 explanation for people giving out their credentials was simple: to be kind. According to over 62 percent of streamers, sharing access to their accounts was a friendly gesture. 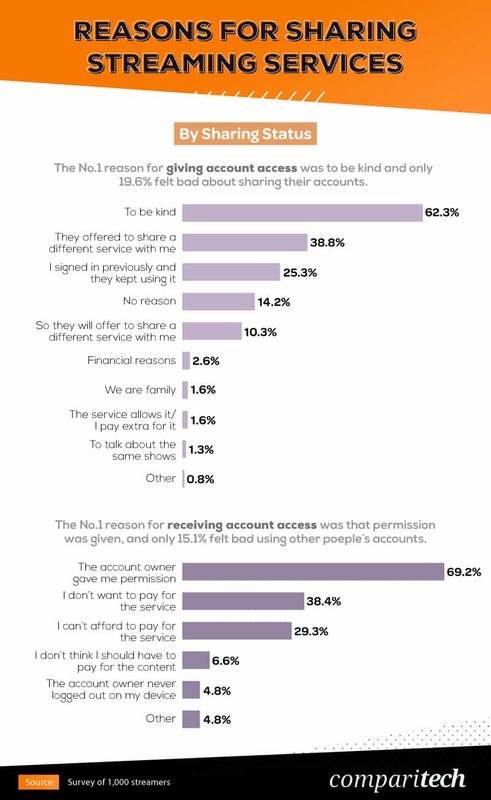 Another 39 percent shared their account because the recipient shared a different service with them, and 25 percent did so perhaps unintentionally – they signed in once, and the recipient kept using the account. Among those who shared their streaming services with others, less than 1 in 5 felt bad about passing along their passwords. The same was mostly true for people accepting account access. While 38 percent of those logging in with someone else’s information didn’t want to pay for the service, 69 percent said they did so because the account owner gave them permission. Roughly 29 percent of respondents acknowledged being unable to afford a borrowed streaming service. So just how far are these rogue streaming accounts traveling? Gen Zers were more likely than any other generation to provide access to their login information to someone outside their household. 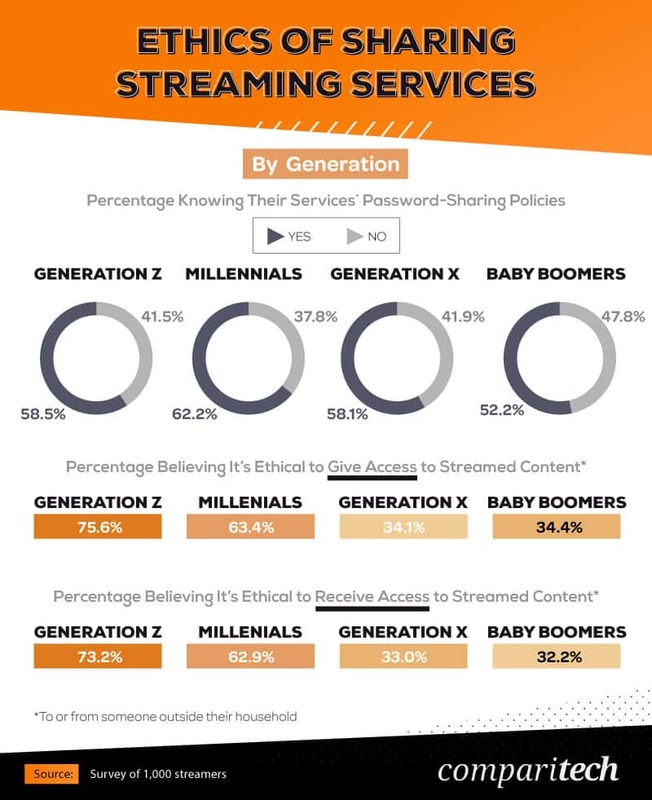 Compared to just 30 percent of baby boomers, 32 percent of Gen Xers, and 48 percent of millennials, nearly 56 percent of Gen Zers admitted to sharing their streaming access with people outside their household. In most cases, it was significant others and friends who benefited from their generosity. Many people providing access to free streaming were less likely to be as benevolent with their family members, including parents (50 percent), siblings (44 percent), and children (15 percent). 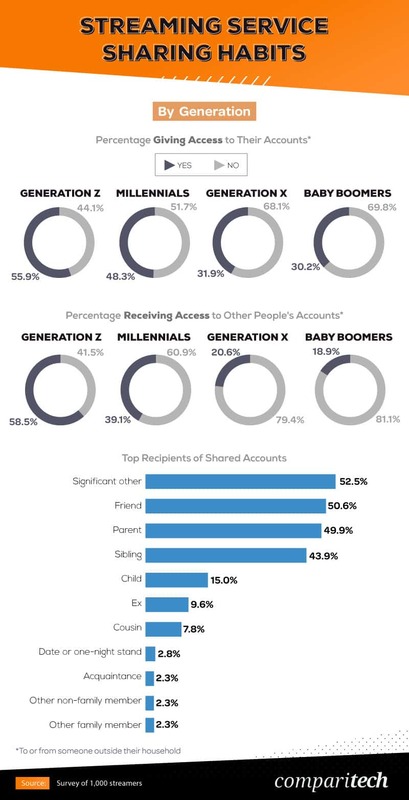 While nearly 59 percent of Gen Zers confessed to receiving access to someone else’s account outside their household, just 21 percent of Gen Xers and 19 percent of baby boomers said the same. In 2016, streaming exclusivity blossomed in the music industry. With the introduction of rival platforms like Tidal and Apple Music to industry titans Pandora and Spotify, certain big-name artists began licensing their tracks exclusively to one service or another. Even Netflix isn’t satisfied being known exclusively for its TV content (however well-reviewed) and continues to look for its acclaim as a prestige movie production company too. Nearly 27 percent of Gen Zers identified streaming services as critical in gaining access to music, more than any other generation. 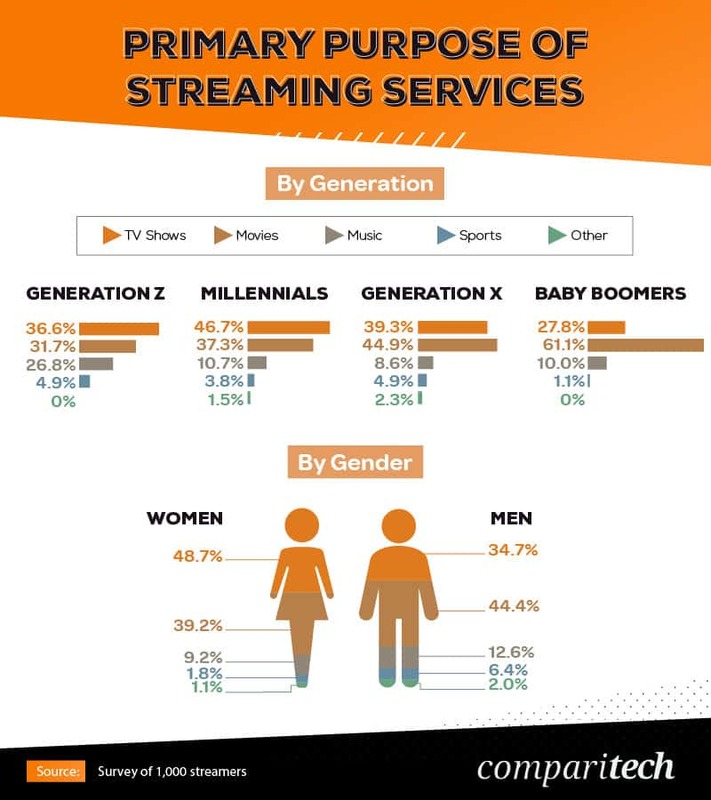 By contrast, streaming TV was more common among millennials than either older or younger generations of streamers. While roughly 39 percent of Gen Xers and 28 percent of baby boomers used streaming services also to access TV, many more (including 61 percent of baby boomers) used programs like Netflix and Hulu for their feature-length movie content instead. If you want to watch popular shows like “The Handmaid’s Tale” or “The Crown,” you won’t be able to escape either paying for or borrowing someone’s login information for Hulu or Netflix. As popular as streaming has become for everything from TV and movies to music and sports, there’s still plenty of sharing going on. More common with MLB.TV and HBO NOW than any other platform, a lot of people either give out or receive shared access to these programs. With the biggest price increase in Netflix history coming in 2019, you should be thinking about how you can get the most out of your account – and pay the least for it. Netflix prices vary by country, and depending on the size of your regional Netflix library, you might be getting a raw deal. The good news is you can watch Netflix through a VPN to access other countries’ libraries, as long as you know which VPNs to use. Comparitech has logged thousands of hours of in-depth research to help you choose a VPN and unblock geo-locked content from around the world. Visit us online at Comparitech today to learn more! We collected responses from 1,000 people who stream some form of online content from Amazon’s Mechanical Turk. Fifty-four percent of our participants were female, 45 percent were male, and 1 percent were nonbinary. Participants ranged in age from 18 to 84 with a mean of 36 and a standard deviation of 11.3. Participants who were not currently using a subscription streaming service at the time they took the survey were excluded. No statistical testing was performed, so the claims listed above are based on means alone. Sharing this story isn’t a federal crime, and you won’t even have to ask your buddy for their login information. We welcome the circulation of this research and all accompanying graphics for any noncommercial use with the inclusion of a link to this page in your article.